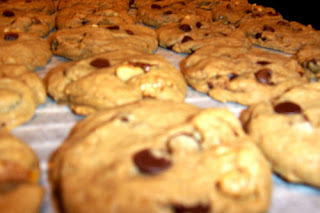 Food Notebook: Chocolate Chip Cookies! I love baking chocolate chip cookies as much I love eating them. I do not have one particular recipe. I like trying out new recipes each time and my family and friends help me ferret out the good ones from the bad. Here’s a basic Chocolate Chip Cookie recipe that bakes up perfect every time. This is basically the same as the Hershey's® recipe, and only differs slightly from the Original Nestle's® Tollhouse Chocolate Chip Cookie. Heat oven to 350-375 degrees, depending on how hot your oven runs. * In a small bowl, combine flour, soda and salt. Set aside. * In a larger bowl, beat butter until soft. Then add sugar and vanilla and beat until smooth. * Add eggs, one at a time, and beat just until blended. * Gradually add flour mixture and blend well. * Stir in chips and drop dough onto cool, ungreased cookie sheets, using a Tablespoon or large dinner spoon. * Bake for 10-12 minutes until lightly browned, do not over bake. * Cool on wire racks and store in an airtight container.